This article is about Canada's national motto. For other uses of the phrase "From Sea to Sea", see Sea to Sea (disambiguation). "Et dominabitur a mari usque ad mare, et a flumine usque ad terminos terrae"
(King James Bible: "He shall have dominion also from sea to sea, and from the river unto the ends of the earth"). The first recorded use of the phrase to represent Canada was by George Monro Grant, who was Sandford Fleming's secretary and a Presbyterian minister who used the phrase in his sermons. His great-grandson Michael Ignatieff suggests that Grant used the phrase in a nation-building effort during the construction of the Canadian Pacific Railway. The use of the word "dominion" in the verse reflected the common use of the name "Dominion of Canada" for the new country. The motto was first officially used in 1906 on the head of the mace of the new Legislative Assembly of Saskatchewan. This phrase was suggested for a national motto by Joseph Pope, then-Under Secretary of State, when the Canadian coat of arms was redesigned in 1921. Pope was a member of the four-person committee appointed by the federal government to redesign the coat of arms (the other members were Thomas Mulvey, A.G. Doughty and Major-General W.G. Gwatkin). No motto had been included in the original design. Major-General W.G. Gwatkin proposed "In memoriam in spem" ("In memory, in hope") as a motto, but Pope's proposal garnered more support. The draft design was approved by Order in Council on April 21, 1921, and by the Royal Proclamation of King George V on November 21, 1921. As part of the Canadian coat of arms, the motto is used as a mark of authority by various government agencies and representatives. It is also present on all denominations of Canadian paper currency, and on the cover of Canadian passports. On its own, it appears on all federal government proclamations. 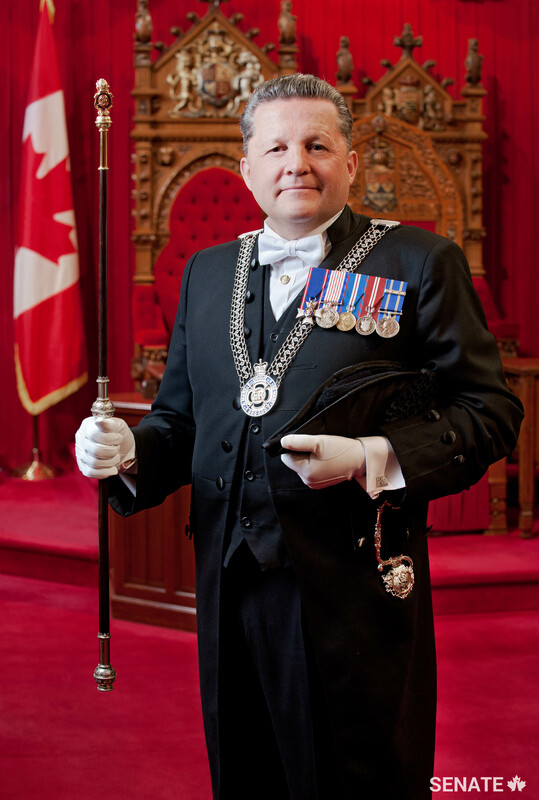 The motto is also featured on the badge on the livery collar worn by the Senate's Usher of the Black Rod. In March 2007, the premiers of Canada's three territories called for the amendment of the motto to reflect the vast geographic nature of Canada's territory, as Canada has coastlines on the Arctic, Atlantic, and Pacific Oceans. Two suggestions for a new motto are A mari ad mare ad mare (from sea to sea to sea) and A mari usque ad maria (from the sea to the other seas). The expanded informal version of the motto ("From Sea to Sea to Sea") is used in speeches and writings about Canada, representing inclusiveness toward northern residents and the growing significance of the Arctic in Canada's political and economic future. A Canwest Global-commissioned poll showed proponents of amending the motto outnumbering opponents in the ratio of three to one, with one-third of those polled neutral. ^ a b c Lamb, W. Kaye. "A Mari usque ad Mare". The Canadian Encyclopedia. Historica Foundation of Canada. Retrieved 2008-11-21. ^ Ignatieff, Michael (2009). True Patriot Love. Toronto: Penguin Canada. ISBN 0-670-06972-8. ^ "Ceremonial and Canadian Symbols Promotion - The arms of Canada (page 2)". Canadian Heritage. 2008-06-23. Retrieved 2008-11-21. ^ "Canadian Heritage: The arms of Canada". Canadian Heritage. Retrieved 2009-06-26. ^ "Canadian Heritage: First "Canadian flags"". Canadian Heritage. Retrieved 2009-06-26. ^ "Library of Parliament - Canadian Symbols at Parliament". Parliament of Canada. Archived from the original on 2007-11-05. Retrieved 2008-10-01. ^ a b c Boswell, Randy (2009-05-10). "Ignatieff supports changing Canada's two-ocean motto". National Post. Archived from the original on 2009-05-12. Retrieved 2009-06-27. ^ Andrew Chung (2007-10-28). "TheStar.com | Ideas | Time to herald our northern coast?". Thestar.com. Archived from the original on 13 October 2008. Retrieved 2008-11-21. ^ Deveau, Scott (2006-09-03). "From sea to sea to sea". Theglobeandmail.com. Archived from the original on 2012-01-30. Retrieved 2008-11-21. ^ CBC News (2006-03-10). "'To sea' or not 'to sea': that is the question". Cbc.ca. Retrieved 2008-11-21.